The first thing I noticed when I opened up the box for the HyperX Cloud headset from Kingston was how nicely everything was packed inside. A sturdy box opens to reveal solid foam padding, with the Cloud headset and all its various accoutrements nestled inside. I slowly removed all of the package’s contents – the numerous attachments and accessories, the extra velour earcups and mesh nylon bag, and the headset itself, everything feeling solidly built and ready to take a beating. 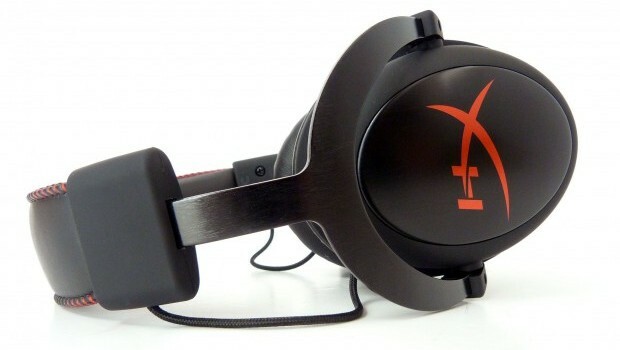 If there’s one thing I must say right off, it’s that the HyperX Cloud headset makes a fantastic first impression. It looks unassuming at first glance, lacking the loud, boisterous colors and ridiculous angles and contours of many of its gaming-focused brethren. Built from solid aluminum, the Cloud features a sleek and minimalistic black and red color scheme. Holding it in my hands feels good, as the Cloud has a nice heft to it. Its rugged build ensures that it can withstand anything you can throw at it, and its build quality feels like like it belongs to a set of headphones that cost at least twice as much. I put the Cloud through its paces, listening to various tunes, throwing on a couple TV shows, and playing some games on my PS4. Everything sounded great – low ends sounded appropriately bassy and individual notes and words come across crystal clear. No, there isn’t any Dolby surround sound support, but the sound quality is perfectly fine for the $99.99 asking price, and unless you have the volume jacked all the way up, the closed earcups keep the noise to yourself. Volume is a tad quiet on the PlayStation 4, though I’ve had similar problems with other headphones, so that problem is likely with the system itself. The included microphone detaches (in case you’re done with gaming and want to take them with you), and projects your voice crisply whether you’re chatting with other gamers or simply recording your voice on your computer. With the Cloud headset being all metallic and sturdy, you’d think that wearing it for extended periods of time would become painful, but it’s actually incredibly comfortable, even after listening to music for a several hours. The included leatherette cups are fine, but the velour cups are fantastic – though they are a bit of a pain to switch out. The Cloud headset may appear heavy at first glance, but all but disappear when you’re actually wearing them, thanks to the aluminum construction..
Kingston’s HyperX Cloud headset may not be the most advanced or technically impressive set of headphones in the world, but the build quality and level of comfort are absolutely fantastic for the sub-$100 price. If you’re looking for an inexpensive pair of entry-level headphones without sacrificing quality, or something that you can bring to your next LAN party without worrying about breaking, look no further. The HyperX Cloud headset from Kingston is a solidly constructed, extremely comfortable entry-level headset that, while lacking in bells and whistles, is great at what it does. The nice price definitely helps.